Mercury was named by the Romans after the fleet-footed messenger of the gods because it seemed to move more quickly than any other planet. It is the closest planet to the Sun, and second smallest planet in the solar system. Its diameter is 40% smaller than Earth and 40% larger than the Moon. It is even smaller than Jupiter's moon Ganymede and Saturn's moon Titan. If an explorer were to step onto the surface of Mercury, he would discover a world resembling lunar terrain. Mercury's rolling, dust-covered hills have been eroded from the constant bombardment of meteorites. Fault-cliffs rise for several kilometers in height and extend for hundreds of kilometers. Craters dot the surface. The explorer would notice that the Sun appears two and a half times larger than on Earth; however, the sky is always black because Mercury has virtually no atmosphere to cause scattering of light. As the explorer gazes out into space, he might see two bright stars. One appearing as cream colored Venus and the other as blue colored Earth. Until Mariner 10, little was known about Mercury because of the difficulty in observing it from Earth telescopes. At maximum elongation it is only 28 degrees from the Sun as seen from Earth. Because of this, it can only be viewed during daylight hours or just prior to sunrise or after sunset. When observed at dawn or dusk, Mercury is so low on the horizon that the light must pass through 10 times the amount of Earth's atmosphere than it would if Mercury was directly overhead. During the 1880's, Giovanni Schiaparelli drew a sketch showing faint features on Mercury. He determined that Mercury must be tidally locked to the Sun, just as the Moon is tidally locked to Earth. 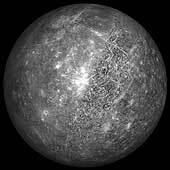 In 1962, radio astronomers looked at radio emissions from Mercury and determined that the dark side was too warm to be tidally locked. It was expected to be much colder if it always faced away from the Sun. In 1965, Pettengill and Dyce determined Mercury's period of rotation to be 59 +- 5 days based upon radar observations. Later in 1971, Goldstein refined the rotation period to be 58.65 +- 0.25 days using radar observations. After close observation by the Mariner 10 spacecraft, the period was determined to be 58.646 +- 0.005 days. Although Mercury is not tidally locked to the Sun, its rotational period is tidally coupled to its orbital period. Mercury rotates one and a half times during each orbit. Because of this 3:2 resonance, a day on Mercury (sun rise to sun rise) is 176 Earth days long as shown by the following diagram. During Mercury's distant past, its period of rotation may have been faster. Scientists speculate that its rotation could have been as rapid as 8 hours, but over millions of years it was slowly despun by solar tides. A model of this process shows that such a despinning would take 109 years and would have raised the interior temperature by 100 degrees Kelvin. Most of the scientific findings about Mercury comes from the Mariner 10 spacecraft which was launched on November 3, 1973. It flew past the planet on March 29, 1974 at a distance of 705 kilometers from the surface. On September 21, 1974 it flew past Mercury for the second time and on March 16, 1975 for the third time. During these visits, over 2,700 pictures were taken, covering 45% of Mercury's surface. Up until this time, scientists did not suspect that Mercury would have a magnetic field. They thought that because Mercury is small, its core would have solidified long ago. The presence of a magnetic field indicates that a planet has an iron core that is at least partially molten. Magnetic fields are generated from the rotation of a conductive molten core and is known as the dynamo effect. Mariner 10 showed that Mercury has a magnetic field that is 1% as strong as Earth's. This magnet field is inclined 7 degrees to Mercury's axis of rotation and produces a magnetosphere around the planet. The source of the magnetic field is unknown. It might be produced from a partially molten iron core in the planet's interior. Another source of the field might be from remnant magnetization of iron-bearing rocks which were magnetized when the planet had a strong magnetic field during its younger years. As the planet cooled and solidified remnant magnetization was retained. Even before Mariner 10, Mercury was known to have a high density. Its density is 5.44 g/cm3 which is comparable to Earth's 5.52g/cm3 density. In an uncompressed state, Mercury's density is 5.5 g/cm3 where Earth's is only 4.0 g/cm3. This high density indicates that the planet is 60 to 70 percent by weight metal, and 30 percent by weight silicate. This gives a core radius of 75% of the planet radius and a core volume of 42% of the planet's volume. The pictures returned from the Mariner 10 spacecraft showed a world that resembles the moon. It is pocked with craters, contains hugh multi-ring basins, and many lava flows. The craters range in size from 100 meters (the smallest resolvable feature on Mariner 10 images) to 1,300 kilometers. They are in various stages of preservation. Some are young with sharp rims and bright rays extending from them. Others are highly degraded, with rims that have been smoothed from the bombardment of meteorites. The largest crater on Mercury is the Caloris basin. A basin was defined by Hartmann and Kuiper (1962) as a "large circular depression with distinctive concentric rings and radial lineaments." Others consider any crater larger than 200 kilometers a basin. The Caloris basin is 1,300 kilometers in diameter, and was probably caused by a projectile larger than 100 kilometers in size. The impact produced concentric mountain rings three kilometers high and sent ejecta 600 to 800 kilometers across the planet. (Another good example of a basin showing concentric rings is the Valhalla region on Jupiter's moon Callisto.) The seismic waves produced from the Caloris impact focused onto the other side of the planet and produced a region of chaotic terrain. After the impact the crater was partially filled with lava flows. Mercury is marked with great curved cliffs or lobate scarps that were apparently formed as Mercury cooled and shrank a few kilometers in size. This shrinking produced a wrinkled crust with scarps kilometers high and hundreds of kilometers long. 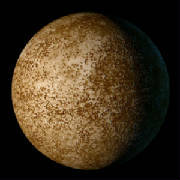 The majority of Mercury's surface is covered by plains. Much of it is old and heavily cratered, but some of the plains are less heavily cratered. Scientists have classified these plains as intercrater plains and smooth plains. Intercrater plains are less saturated with craters and the craters are less than 15 kilometers in diameter. These plains were probably formed as lava flows buried the older terrain. The smooth plains are younger still with fewer craters. Smooth plains can be found around the Caloris basin. In some areas patches of smooth lava can be seen filling craters. Mercury's history of formation is similar to that of Earth's. About 4.5 billion years ago the planets formed. This was a time of intense bombardment for the planets as they scooped up matter and debris left around from the nebula that formed them. Early during this formation, Mercury probably differentiated into a dense metallic core, and a silicate crust. After the intense bombardment period, lava flowed across the surface and covered the older crust. By this time much of the debris had been swept up and Mercury entered a lighter bombardment period. During this period the intercrater plains formed. Then Mercury cooled. Its core contracted which in turn broke the crust and produced the prominent lobate scarps. During the third stage, lava flooded the lowlands and produced the smooth plains. During the fourth stage micrometeorite bombardment created a dusty surface also known as regolith. A few larger meteorites impacted the surface and left bright rayed craters. Other than the occasional collisions of a meteorites, Mercury's surface is no longer active and remains the same as it has for millions of years. Could water exist on Mercury? It would appear that Mercury could not support water in any form. It has very little atmosphere and is blazing hot during the day, but in 1991 scientists at Caltech bounced radio waves off Mercury and found an unusual bright return from the north pole. The apparent brightening at the north pole could be explained by ice on or just under the surface. But is it possible for Mercury to have ice? Because Mercury's rotation is almost perpendicular to its orbital plain, the north pole always sees the sun just above the horizon. The insides of craters would never be exposed to the Sun and scientists suspect that they would remain colder than -161 C. These freezing temperatures could trap water outgassed from the planet, or ices brought to the planet from cometary impacts. These ice deposits might be covered with a layer of dust and would still show bright radar returns. The Early Formation of Mercury. The Final Stages in Mercury's Formation.